She's No Man; She's A Lobsterman In New England, more women are breaking through the glass gangway. For generations lobstermen in Maine have been predominantly, well, men — but that's starting to change. Lobsterman Genevieve Kurilec holds a lobster caught while fishing along Deer Isle, Maine. Kurilec says more women are beginning to captain their own lobster boats. In New England, more women are breaking through the glass gangway. That's the ramp you use to walk down onto a dock to hop onboard your own fishing boat. For generations lobstermen in Maine have been predominantly, well, men — but that's starting to change. At a small gas dock in a rock-lined cove on Deer Isle, Maine, there's a new captain fueling up. 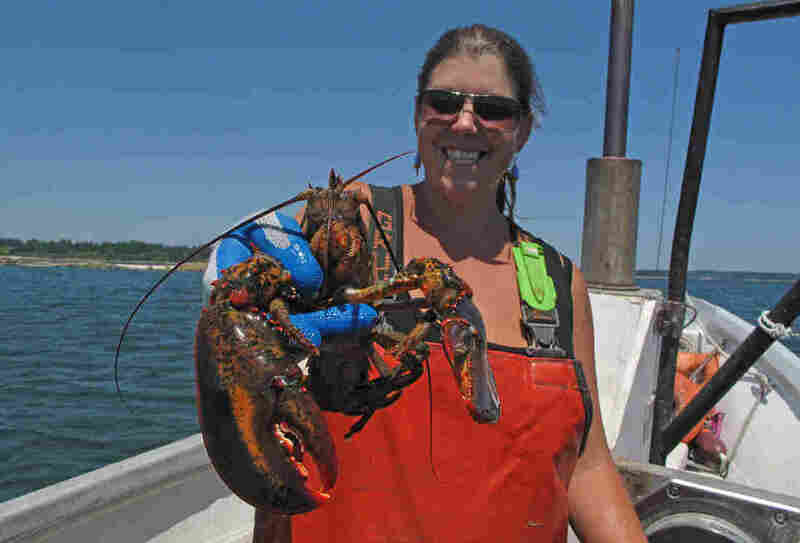 Genevieve Kurilec, 29, wears a tank-top, orange fishing overalls and lobster buoy earrings. ... there's always been women fishermen in our area, you just see a lot more of it now. Kurilec's vessel, Hello Darling, is a small lobster boat. It has a standup center console with a steering wheel — no roof or cabin for shade. The engine fires right up, and Kurilec is clearly happy to be heading out into the harbor. She still remembers the first day she came out here last year, as the captain of her own boat. "It was the most exciting day of my life that I can remember in near times. It's something I worked towards for six years," Kurilec says. "I was definitely nervous the first few times I came out. Luckily, I had a childhood friend that came out with me last year as my sternman. He made sure I was keeping it together. Now I love it." Kurilec calls herself a lobsterman, though she's a woman. "The lobster fishing industry isn't necessarily always politically correct," she says. Kurilec grew up just east along the coast near Acadia National Park. When she was a kid, she wanted to be a marine biologist. After high school, she got into racing sailboats and spent time crewing on boats down in the Caribbean. She then came back to Maine and was working in boatyards and started becoming friends with more fishermen. When she was working at a boatyard in Blue Hill, a sternman needed someone to fill in. "I was sitting in our local bar. One of the bigger fishermen from Stonington came in, and he bet me that I couldn't fish out of Stonington," Kurilec says. "So I accepted the job and went with him for a year. It was a good job ... I enjoyed it a lot." 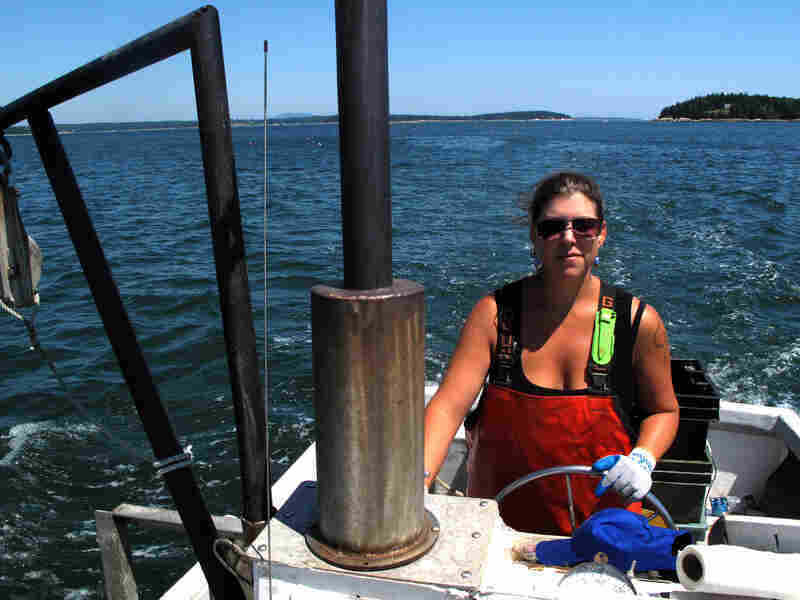 Genevieve Kurilec pilots her boat, Hello Darling, near the coastal waters of Maine. Kurilec, 29, has worked on or around boats since graduating high school. Being a sternman is hard work. The captain on larger boats gets to drive, and is shaded from the sun. The sternman is out on the stern — the back of the boat — and has to haul up the traps and re-bait them. The traps are heavy, upward of 40 pounds. They're made of wire mesh, but have bricks or cement runners to keep them on the ocean floor. "Guys that kind of teased me in the beginning are really supportive now. You know, I can break a big, 4-foot concrete trap over the rail just as well as anybody else," Kurilec says. "Women tend to be faster with their hands. ... And we show up on time, we show up sober and we don't argue with the captain so much." Kurilec guides her boat over to one of her maroon-colored lobster buoys. Her electric power winch pulls the trap to the water's surface, then Kurilec lifts it onto the boat's rail. The ocean water in Maine is cold and clear, so even 30 feet down or so, Kurilec can see where the sand meets some rocks. That's where you want to set your trap. Kurilec says when the recession hit five years ago, more women came into lobster fishing. She says the demand and price for lobsters fell. Instead of paying a sternman, some captains decided to keep the money in the family. "I think it really gave a lot of women that chance. Your son probably has his own boat and is fishing somewhere, but your daughter's home and she's willing to go," she says. "I really think it opened up a lot of opportunities. Keeping in mind there's always been women fishermen in our area, you just see a lot more of it now." This summer has been tough. The price of lobster has been down, but Kurilec is still happy she took the plunge. "To me, every time I leave the dock, it's a little exciting," she says. "I wouldn't want to be doing anything else today."